Me: Do you like waffles? Kids: What kind of waffles? Me: Do you like pancakes? Kids: We sorta like pancakes. Me: Do you like french toast? Kids: I don’t think I like french toast. Dodododo, can’t wait to get a mouth full! Kids: We sorta like waffles. Kids: Only choc’late chip pancakes. Kids: We said no to french toast. Okay, so maybe it doesn’t go exactly like that… but sometimes it seems that way. Be sure to see some of Parry Gripp’s other great songs/videos at parrygripp.com and on You Tube. We simply don’t know what to say about this… except that it scares us. While most of the surface world was still basking in the happy hopeful glow generated by Tuesday’s inauguration of President Obama, another equally important transfer of power took place 45 miles off the coast of Hawaii: Aquaman was crowned King of Atlantis. Aquaman’s coronation came after nearly a year of hard campaigning against rival Black Manta. Despite critics’ claims that the election was an unnecessary exercise, given Aquaman’s royal lineage and Black Manta’s past crimes against the kingdom, the mer-people of Atlantis turned out in record numbers to cast their vote this past November. 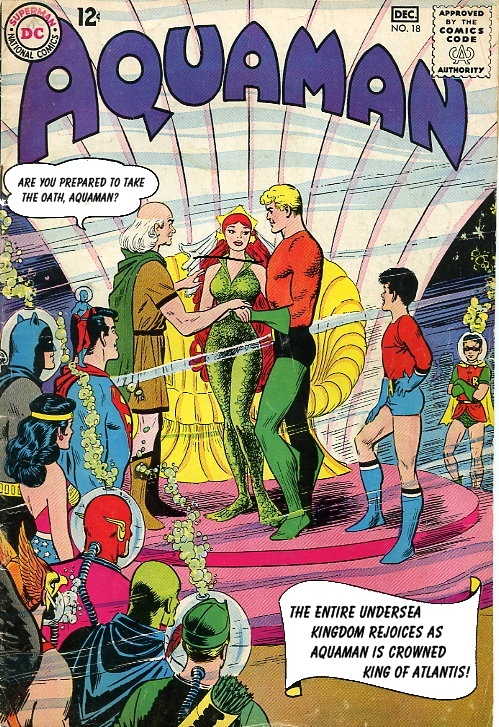 Aquaman’s message of change and improved relations with the surface world resonated with the younger Atlanteans, and he took the popular vote by a 17 point margin. After the Justice League had originally thrown their support behind Superman in the Atlantean primaries, some wondered if members of the League would make the trip for the inauguration;as you can see from the photo above, it appears all the fences have been mended. Notably absent, however, were his opponent, Black Manta, and Aquaman’s estranged cousin, Prince Namor – the Sub-Mariner. Political forecasters are expecting Aquaman’s first hundred days to be eventful. He will be forced to make difficult choices with regard to Atlantean support of the Green Lantern Corps in their extended conflict with the Yellow Lanterns. Relations between Atlantis and Oa have been strained since footage was leaked of Earth GL Guy Gardiner taunting Sinestro while the latter was awaiting trial on Oa. Aquaman’s appointment of John Stewart as honorary abassador to Oa is being interpreted as a sign of continued support of the corps in their conflict; however, Aquaman will be pressured to live up to his promise of setting a “timetable for withdrawing Atlantean troops from space.” Support for the war among Atlanteans has waned considerably as the economic collapse of the surface world began to reach the undersea kingdom. Aquaman knows the people of Atlantis are looking to him to firm up the Atlantean economy. It’s one of his top priorities, and he intends to introduce an innovative stimulus package at the next meeting of the High Council of Elders. Another pressing issue Aquaman wil have to address is the surface world’s discovery of methane on Mars. Atlantis has long served as a “safe zone” for the Martian people. The mishandling of waste material by the Martian community and the resulting methane cloud on the red planet have raised concerns about the risks harboring Martians on Atlantis. A recent poll revealed “maintaining Atlantis’ undetectability by the surface world” to be the number one concern among Atlanteans age 130 – 400. Some pundits are questioning whether the increased flow of Martian traffic into and out of Atlantis puts that at risk. Aquaman is scheduled to appear on Larry King Live next Tuesday to participate in a round table with Al Gore, Jesse Jackson, and Sting. He will meet with new US President Barak Obama, on Wednesday, and he is schedulated to tape an episode of William Shatner’s “Raw Nerve” for A&E later in the week. No air date is currently scheduled. We wish Aquaman well as he begins his reign as ruler of the seven seas. So does anyone really believe that the sixteen people who forget the lyrics to “Build Me Up Buttercup” at the American Idol auditions really were making a serious attempt with that song? Remember, you saw all of them earlier in the show? All right, so they didn’t do very well… they were awful in most cases. But, they were prepared. And they thought they were good. Now all of a sudden, they are singing a second song and blatantly unprepared. They get the words wrong, they ask the camera for a second chance, they admit their general unpreparedness, etc., . This is the power of editing. We don’t see the shows producers telling them to just go ahead and give it a shot. They are being set up and exploited, and it’s just tough to watch. Not all the editing tricks are that obvious. But, think of how many times we see Simon rip someone or Randy roll his eyes only to get a very polite “thank you” from the bashed singer. Everyone realizes that full days’ worth of audition footage is compacted into an hour long show, but I’ve met many people who fail to recognize the effect that has on how the auditions come across. Similarly, it’s often forgotten that the sequence can be altered – producing equally misleading portrayals. I may be in the minority, but I think that the most powerful person in video production is the one who makes the editing choices. Cliff over at gspn.tv found this video, which illustrates the type of manipulating I’m suggesting goes on. I once saw a US produced show which did something similar. It featured the “evil Dr. Will” from Big Brother fame. They illustrated how the same “raw footage” could be used to make it appear that a TV show pitch had gone over very well or very poorly, all through editing. Tonight, on American Idol’s San Francisco show, we saw “the last audition of the night.” We met his family, watched his mother go on about what a fine young man he’s grown up to be, and saw her wish him luck at his audition: she would be unable to attend, after all. Hmmm… so they met him at the audition, went out an interviewed his family and all in his home town, got video footage of his mother wishing him luck before his trip to San Francisco, and then let him audition and got footage of him calling his mother to say he’d made it to Hollywood. Really?!? I think not. Clearly, this was all staged after the fact. But, it was presented as if it had happened in just that way. Now, granted, no one was hurt… in fact, in this case, not even “feelings” were hurt. But very often that is not the case. And it’s not just American Idol, Big Brother, and the other reality TV shows. It happens regularly on the Daily Show as well. The other day they showed Vice-President Biden’s farewall adress to the US Senate as he vacated his senate seat and made it appear as if Biden had spoke for hours. A careful eye could catch the CSPAN clock in the corner and recognize the clips had actually happened in a different sequence and within a far more compact span of time. They do it all the time on the Daily Show, and I have to admit, they make no pretense of delivering “real news” – they are a comedy show. But a “reality” TV show is often taken as reality by its viewers. It’s scary how many people take what they see as the unedited truth. I suppose that’s where my real gripe lies… with the folks who can’t see through the editing – not the editing itself. But I’ll lash out at them another day. Woopra indicates that we had a visitor to the site today who got here by searching “reaction to aloe toilet paper” on Google. Even more inriguing is the fact that they only spent 1 second on the site. Apparently they had one of those “whoa, this is not at all what I was looking for” moments and fled. Did they even have to click on the link to figure that out? Couldn’t they glean enough from the link title and short description on Google? We apologize for not providing more meaningful toilet paper-related content. However, looking back at our mission statement and such, we find we made no promise to do so. Our guess is that Google grabbed references to aloe toilet paper from Scott Copperman’s contribution about things you don’t see advertisements for but buy all the time. We wish this stranger from… Verwoerdburg, South Africa (we kid you not), would have stayed and explored the site a bit more. But, we suspect that our visitor was dealing with some serious issues and considerable discomfort stemming from a reaction to aloe toilet paper that needed immediate attention. Poking around our site, understandably, could wait. Well, our South African friend, we hope that you have found relief online from a more appropriate source. On the off chance that you return to us one day by means of a follow up search (or if you, kind reader, are some other person who arrived at That Other Page by means of a similar misguided search referral about “battery chargers,” “hockey cards,” or some other conglomeration of words we’ve used in a post) – please do take some time to explore the archives of our blog. There are many good pages with clever content and good links buried within. Now that we’ve formally typed that phrase “reaction to aloe toilet paper” several times, we should probably expect more visitors seeking relief for their irritated bottoms. Perhaps we should put a disclaimer in the header? Wow… the Arizona Cardinals made it to the Super Bowl. As many of you know, I have season tickets to the Cardinals. The original plan was to be living there, in the shadow of Phoenix, but when those plans fell through we kept our tickets… thinking that one day in the far future, the team might be a consistent playoff threat. Who knew it would only take two years? There’s a whole story about what I did with my 2009 playoff tickets, (it’s a happy/good one) but I’ll save that for another day. Anyway, with San Diego having come up short against the (eventual AFC Champs) Pittsburgh Steelers, Jay and I threw our full support behind our #2 favorite team… the Arizona Cardinals. It was a great game, reminiscent of the old Air Coryell Chargers, right down to the Dan Fouts-like performance by Kurt Warner: throwing for another 300+ yards. I’ll write more about the Cardinals as the big game gets closer. After two test recordings, dozens of emails, tweets, and forum posts… today is the day. I’ll be Skyping with Elton in about 4 hours, and then we should be able to get our first formal episode on podomatic by Tuesday AM. I think it’s going to come out well. Jay and I have been dabbling in the art of (cue Doug Henning parody-style “Art of Illusion” chime sound…) Stop Motion animation. It’s all very raw, but he’s getting the hang of it. Earlier this week he produced a funny “Don’t Litter” Public Service Announcement video almost entirely on his own. He worked for over 2 hours, took more than 240 pictures, to produce 37 seconds of animation. He then invested another hour creating bumps and title cards. It’s a feat that’s even more impressive if you know some of the obstacles he has to overcome to do work like that. I’m very proud of him, and I’m pleased he’s starting to find creative outlets and developing a passion for them. It’s funny too, because Jay was only required to produce a poster or give a speech. However, right away he indicated he wanted to make a video. The assignment was given Monday, he got approval from his teacher Tuesday (she didn’t know what a stop motion was), he did all his filming on Tuesday night, and produced the video Wednesday afternoon so that his teacher could approve it prior to the assignment being formally due (in case he had to do something different). She was having some trouble getting the .avi file version of the animation to play on her computer, so we made some alternate forms for her Thursday night. I didn’t think that logging into youtube was a viable option so we burned a playable DVD and provided her with a flash version this morning. Hopefully it’ll work, and she gives him good feedback. We’ll see. You are currently browsing the That other blog blog archives for January, 2009.